Martin Keenan, who won his first Irish title three years ago in the colours of Ennis Boxing Club, hit the headlines on Friday night in the National Stadium when he captured the Irish Elite Super-heavyweight title in style, to etch his name in Clare’s sporting history. It was a big surprise for the unranked, unheralded Ennis lad, who went from strength to strength in these championships and totally upset the odds that were stacked against him from the outset three weeks ago. 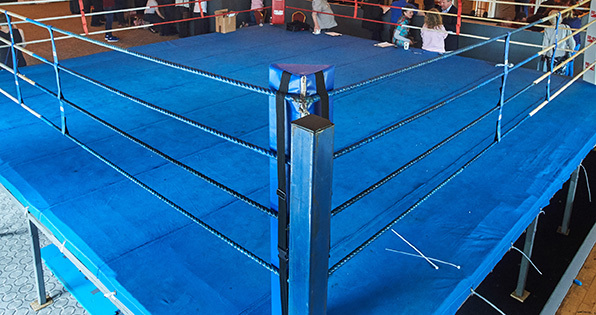 He is the first Clare fighter to reach the podium since James Clancy won the heavyweight title back in the 1990s for Kilfenora, with Ennis boxing legend Ollie Markham in his corner. Keenan took a 4-1 split decision over Thomas Carty from the Glasnevin club in a torrid battle, after recovering from an indifferent first round, in which he found Carty’s southpaw reach virtually impenetrable. He was off-target with his usually devastating right-hand shots to the head but a change of tactics from coach Robbie Williams for the second and third rounds saw Keenan utilising a great left jab, to prise open the Dubliner’s defence. He maintained a steady barrage that ultimately impressed the judges in the final round. Keenan admitted to being exhausted at the final bell but he did feel that his blistering assaults through the final round were sufficient to carry the day, as the five judges deliberated. The sound of his name from the ringmaster ignited some wild celebrations from the large following from Clare and from his club, Rathkeale. It was a moment he will never forget and the celebrations went long into the night for the delighted Clare contingent. The Ennis native has now shelved his celebrations however, as he prepares for the Ireland/England international in London on Friday next. Ennis club official Tommy Lyons, who acted as judge for the duration of the senior championships, was inundated with congratulatory messages in the National Stadium and was proud of Keenan’s triumph. He paid warm tributes to the Williams brothers, Robbie and Peter, from the Rathkeale club, who have coached Keenan since he moved there from Ennis last year. 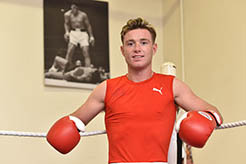 The new champion will now be drafted onto the elite high performance squad and will have full-time training facilities, both in the National boxing stadium and in the Olympic Training Centre in Abbottstown. He has just turned 22 and will have lots of international experience in the coming months. 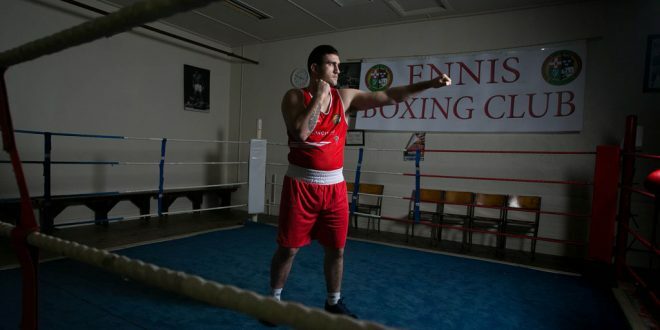 Martin Keenan from Ennis is the new Irish Elete Super-heavyweight boxing champion.